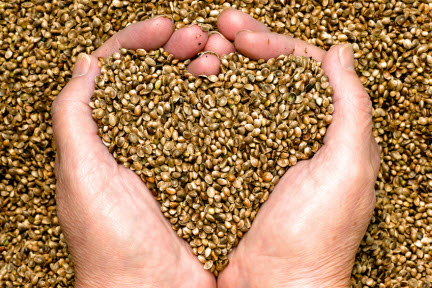 What Are the Nutritional Benefits of Hemp Hearts? Hemp hearts, or shelled hemp seeds, are a growing craze in natural healthy eating. They have become widely available in natural food markets as well as supermarkets and larger stores. The reason why hemp hearts have become so widely enjoyed is because of their mild flavor and incredible nutritional qualities. Without the addition of sugar and excess carbohydrates, hemp hearts provide essential omega-3 and omega-6 fatty acids, coarse fibers and plant sterols, and a complete range of the proteins needed in a balanced diet. Because of their unbeatable nutritious value, hemp hearts are excellent for digestion, energy, and cellular health. As part of your regular diet, they can also promote weight loss as a natural appetite and craving suppressant. Despite common misconceptions about hemp seeds, they do not contain THC. You can just eat hemp hearts by the handful, but they are delicious in a wide variety of more creative applications. They can be sprinkled on salads, blended into smoothies, or served on oatmeal. They do need to be kept in the refrigerator for freshness, and they are best served raw. Shelled hemp seeds are a great addition to any diet, but they can be particularly beneficial for individuals who are struggling with certain health problems. Diabetics, for example, can enjoy the weight loss benefits and well-rounded lean protein provided by hemp hearts. People with celiac disease or any food allergies can eat hemp seeds to improve digestive comfort and offer complete nutrition without the presence of common allergens. If you want to explore the benefits of raw dieting in the scope of whole-body healing, the holistic healing program at Optimum Health Institute can provide you with an education drawn from 24 ancient spiritual disciplines. To learn how the OHI program can inspire your healing journey for the body, mind, and spirit, visit our website or call (800) style=”font-size: 11px;”>993-4325.